Honey bee queen is usually attended by a group of workers - queen retinue. Older egg laying queens are more attractive to workers than newly mated queens and virgin queens are the least attractive . The workers groom the queen by touching it with their mouthparts, antennae and forelegs. This is sometimes called retinue behaviour. The head and abdomen of the queen are more often touched than the thorax . During winter the contact between the queen and the attending workers is reduced . The workers from the queen retinue feed the queen by trophallaxis. Frequency of feeding is positively correlated with intensity of queen egg laying  see also . Observed number of times the queen was fed during one hour was: 2-3 , 4.8 . During single bout of feeding the queen is fed by one or two (rarely five) workers . The single feeding lasts 47±2.6 seconds  44 seconds . Workers feeding the queen are younger than other attendants . Feeding and licking of the queen is performed more often by workers which spend in the retinue longer time . The retinue workers eat faeces released by the queen. Number of workers in queen retinue ranges from six to ten  and it is smaller in winter than in summer . This number does not differ between night and day . There is continuous change of workers in the retinue. Most attendants spend in the retinue less than 30 seconds, but some of them can spend there 41 minutes . Some workers attend the queen on more than one occasion during their lifetime . Workers often stop attending the queen when it starts to move . When the queen stays still a worker can attend it for relatively long time . The workers in the retinue are relatively young , at similar age they perform brood tending task. 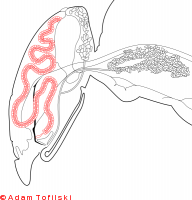 Formation of the retinue can be elicited by queen mandibular pheromone (QMP) . Mixture of five components of QMP is particularly important . Tergal glands secretion  and Dufour's gland secretion  also elicits retinue behaviour in workers. The retinue is formed even around queens with mandibular glands removed . During grooming of the queen pheromones are transferred from the queen to the workers attending it and later to other workers in the colony . Workers which attended the queen for longer than 30 seconds move rapidly, often antennate nestmates and are often inspected by other workers . This behaviour can be important for transmission of the queen pheromones within the nest. The workers which licked the queen transfer particularly large amount of the QMP  see also . The contacts between the queen and the workers attending it can affect health of both the queen and the workers. The workers can infect the queen with Nosema ceranae . Workers infected with Nosema apis are less often observed in the retinue than their healthy nestmates at the same age . The queen can infect the attending workers with Bacillus larvae  and Nosema apis . Retinue behaviour is not affected by octopamine treatment , acaricides treatment  or selection for QMP response . Free J.B., Ferguson A.W., Simpkins J.R. (1992) The behaviour of queen honeybees and their attendants. Physiological Entomology 17:43–55. Allen M.D. (1957) Observations on honeybees examining and licking their queen. Brit. J. Anim. Behav. 5:81-84. Chauvin R. (1956) Les facteurs qui gouverment la ponte chez la reine des abeilles. Insectes Sociaux 3:499-504. Perepelova L. (1928) Nurse bees [in Russian]. Opytnaia Paseka 12:551-557. Allen M.D. (1955) Observations on honeybees attending their queen. Brit. J. Anim. Behav. 3:66-69. Istomina-Tsvetkova K.P. (1953) Reciprocal feeding of bees [in Russian]. Pchelovodstvo 30:25-29. Blom van der J. (1992) Individual involvement in queen-attending of worker honeybees. Insectes Sociaux 39:237–249. 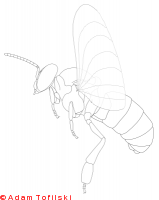 Johnson J.N., Hardgrave E., Gill C., Moore D. (2010) Absence of consistent diel rhythmicity in mated honey bee queen behavior. Journal of Insect Physiology 56:761–773. Butler C.G., Callow R.K., Koster C.G., Simpson J. (1973) Perception of the queen by workers in the honeybee colony. J. Apic. Res 12:159–166. Seeley T.D. (1979) Queen substance dispersal by messenger workers in honeybee colonies. Behav. Ecol. Sociobiol. 5:391-415. Seeley T.D. (1982) Adaptive significance of the age polyethism schedule in honeybee colonies. Behav. Ecol. Sociobiol. 11:287-293. Winston M.L., Punnett E.N. (1982) Factors determining temporal division of labor in bees. Can. J. Zool. 60:2947-52. Pankiw T., Winston M.L., Slessor K.N. (1995) Queen attendance behavior of worker honey bees (Apis mellifera L.) that are high and low responding to queen mandibular pheromone. Insectes Sociaux 42:371–378. Slessor K.N., Kaminski L.A., King G.G.S., Borden J.H., Winston M.L. (1988) Semiochemical basis of the retinue response to queen honey bees. Nature 332:354-356. Wossler T.C., Crewe R.M. (1999) The releaser effects of the tergal gland secretion of queen honeybees (Apis mellifera). 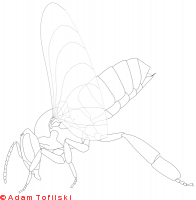 Journal of Insect Behavior 12:343–351. Velthuis H.H.W. (1970) Queen substances from the abdomen of the honey bee queen. Z. vergl. Physiol. 70:210-222. Maisonnasse A., Alaux C., Beslay D., Crauser D., Gines C., Plettner E., Le Conte Y. (2010) New insights into honey bee (Apis mellifera) pheromone communication. Is the queen mandibular pheromone alone in colony regulation? Frontiers in Zoology 7:18. Naumann K., Winston M.L., Slessor K.N., Prestwich G.D., Webster F.X. (1991) Production and transmission of honey bee queen (Apis mellifera L.) mandibular gland pheromone. Behavioral Ecology and Sociobiology 29:321–332. Kralj J., Bozic J. (2001) Activity of attendants after licking and palpating the queen in honeybee (Apis mellifera carnica). Netherlands Journal of Zoology 51:415–419. Higes M., Martín-Hernández R., García-Palencia P., Marín P., Meana A. (2009) Horizontal transmission of Nosema ceranae (Microsporidia) from worker honeybees to queens (Apis mellifera). Environmental Microbiology Reports 1:495–498. Wang D.I., Moeller F.E. (1970) The division of labor and queen attendance behavior of Nosema-infected worker honey bees. Journal of Economic Entomology 63:1540–1541. Bitner A.R., Wilson W.T., Hitchcock J.D. (1972) Passage of Bacillus larvae spores from adult queen honey bees to attendant workers (Apis mellifera). Annals of the Entomological Society of America 65:899–901. Czekońska K. (2000) The influence of Nosema apis on young honeybee queens and transmission of the disease from queens to workers. Apidologie 31:701–706. Barron A.B., Robinson G.E. (2005) Selective modulation of task performance by octopamine in honey bee (Apis mellifera) division of labour. Journal of Comparative Physiology A: Neuroethology, Sensory, Neural, and Behavioral Physiology 191:659–668. Westcott L.C., Winston M.L. (1999) Chemical acaricides in Apis mellifera (Hymenoptera: Apidae) colonies; do they cause nonlethal effects? Canadian Entomologist 131:363–371.